Authentic Psychic Medium. You will feel the difference. ﻿Ann Carter is a remarkable Psychic Medium and Reiki Master known for her ability to get clarity for those seeking answers. Ann will connect with client's angels and guides who stand ready to offer spiritual guidance or direction. Known for her incredible connection with the spirit world, Ann can give you clarity on past, present and future. Ann has also been able to help earth-bound spirits cross over. Ann’s purpose is to help others on their path to personal awakening. Friend request Ann Carter on Facebook! Listen to Ann Carter on Charlotte View every third Friday with AWAKENING! What are people saying ﻿about Ann? 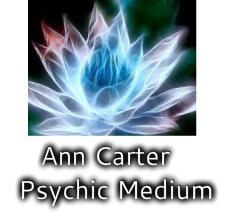 Ann Carter is a genuine medium who practices with integrity and compassion. She brings insight and wisdom to everyone’s session and works for the client without ego to transmit messages from guides and others on the spirit plane. She can be trust to work with honesty and integrity for the greatest good. WOW! I was blown away! Ann was amazing! She helped me with seeing what road blocks I was dealing with and she connected with a loved one. She told me things that only my mom and I talked about.. Ann Carter is the real deal! I'm a client for life. Add me to Ann's email list please!